Save vegetable seeds as you harvest so your favorite plants can grow again next season. 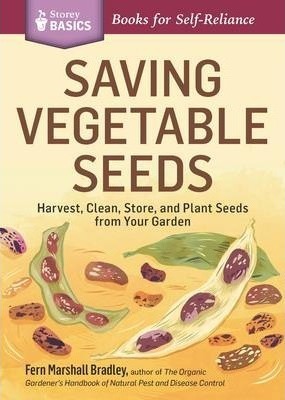 In this Storey BASICS(R) guide, Fern Marshall Bradley covers everything you need to know to successfully save seeds from 20 popular garden vegetables, including beans, carrots, peas, peppers, and tomatoes. Learn how each plant is pollinated, where to store your collected seeds through the winter, and how to test their replanting viability in the spring. Now you can grow the delicious varieties you love year after year. Become more self-sufficient by saving your own seed from one year to the next. Fern Marshall Bradley clarifies how to select the best plants, make seed saving a part of your garden plan, save both wet and dry seed, overwinter biennial crops like carrots, store seed, and test viability before planting. A crop-by-crop guide explains the details of saving the seeds of beans, carrots, corn, cucumbers, lettuce, melons and watermelons, onions and leeks, peas, peppers, radishes, squash, and tomatoes.